A fun take on the classic sandwich. In a small bowl, whisk together Dijon, garlic, salt and pepper. Add vinegar. Slowly whisk in olive oil until combined. Set aside. Cook pasta according to package directions. Drain and pour half of the vinaigrette over warm pasta. Let cool to room temperature. 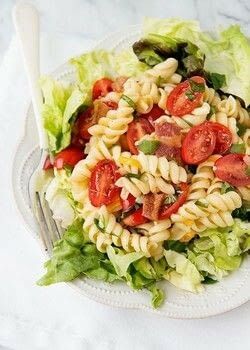 Add bacon, tomatoes, cheese, and herbs. Toss to combine. Add more vinaigrette if needed. Check for seasoning and add more salt and pepper. Serve on a bed of butter lettuce.